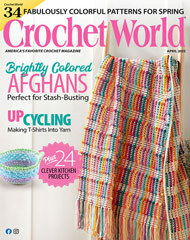 Use the Crochet 'n' Weave technique to stitch an easy afghan design! This free pattern features a flurry of snowflakes and blue and white stripes. If you're a confident beginner, you can make this afghan! Size: About 40" x 61" before weaving, without Tassels.